عزیزی, شهریار. (1395). ترسیم نقشه ذهنی بانکداری خُرد: رویکرد تحلیل تناظر. پژوهش های نوین در تصمیم گیری, 1(3), 65-84. شهریار عزیزی. "ترسیم نقشه ذهنی بانکداری خُرد: رویکرد تحلیل تناظر". پژوهش های نوین در تصمیم گیری, 1, 3, 1395, 65-84. عزیزی, شهریار. (1395). 'ترسیم نقشه ذهنی بانکداری خُرد: رویکرد تحلیل تناظر', پژوهش های نوین در تصمیم گیری, 1(3), pp. 65-84. عزیزی, شهریار. ترسیم نقشه ذهنی بانکداری خُرد: رویکرد تحلیل تناظر. پژوهش های نوین در تصمیم گیری, 1395; 1(3): 65-84. فضای صنعت بانکداری در ایران در دهه اخیر رقابتی‌تر شده است. در این عرصه جدید درک جایگاه بانک در ذهن مشتریان نسبت به رقبا به مدیریت بانک در تدوین برنامه‌های بازاریابی مؤثرتر کمک می‌کند. در همین راستا در این پژوهش 5 بانک پارسیان، پاسارگاد، ملَی، ملت و تجارت به‌عنوان برندهای رقیب انتخاب شدند. در ابتدا به‌منظور شناسایی شاخص‌های مهم در انتخاب بانک 25 مصاحبه انجام شد و با تحلیل محتوا و کدگذاری محوری، هفت عامل: سرعت ارائه خدمات بانکی، وام و تسهیلات، بانکداری الکترونیکی، مشتری مداری، اعتماد، امکانات و فضای شعبه و گستردگی شبکه شعب، شناسایی شد. برای گردآوری داده‌ها جهت ترسیم نقشه پرسشنامه‌ای 18 سؤالی طراحی و 300 پرسشنامه تکمیل‌شده و قابل‌استفاده گردآوری شد. خروجی نقشه جایگاه رقابتی نشان داد که می‌توان دو مؤلفه جهت‌گیری بانکداری (کلاسیک، نوین) و مزیت رقابتی (رفاه و تعامل با مشتری، دسترسی) را شناسایی نمود. از ترکیب حالات مختلف این دو مؤلفه چهار حالت به وجود می‌آید. بر این اساس بانک پاسارگاد در ربع بانکداری نوین و رفاه و تعامل مشتری، بانک ملَی در ربع بانکداری کلاسیک و رفاه و تعامل، بانک ملت و بانک پارسیان در ربع بانکداری نوین و دسترسی و بانک تجارت هم در ربع بانکداری کلاسیک و دسترسی قرار گرفتند. Associate Professor, Department of business management, Faculty of management and accounting, Shahid Beheshti University, Tehran, Iran. Iran’s banking industry became more competitive in past decade. In this new era understanding the position of bank in customers minds compare to competitors help bank managers to formulation more effective marketing. 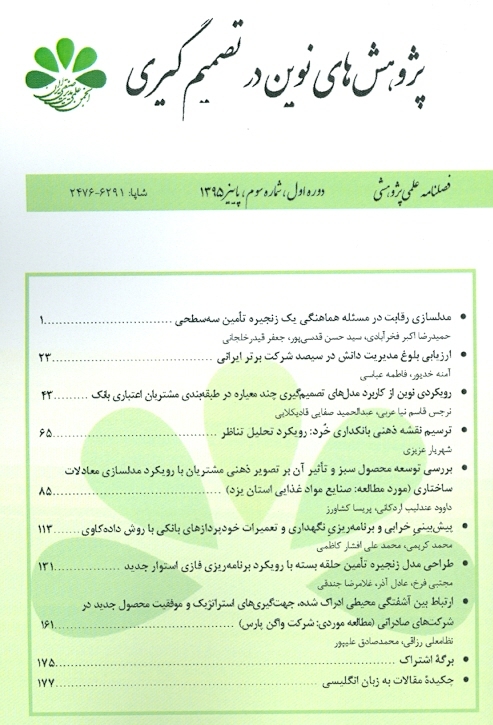 This paper attempted to reveal the position map of five selected banks including: MELL, MELLAT, TEJARAT, PARSIAN and PASARGAD.at the first phase of the research, in-depth interview was done with 25 participants for detecting factors effect bank selection. Via content analysis and using axial coding, seven axial codes were identified: the speed of providing banking services, facility and loan, electronic banking service, customer orientation, trust, physical evidences in branch, breadth of branch network. An 18-items questionnaire was constructed and gathered from 300 respondents from the selected banks. Competitive map was portrayed by simple correspondence analysis. Two dimension were recognized based on the map, the first was banking orientation (classic, modern), and the second was competitive advantage (facilitation of customer access, customer welfare and interaction). Four quarters were identified based on different composition of these dimension. PASARGAD bank was placed in the modern banking and customer welfare/interaction, MELLI bank placed in the classic banking and customer welfare/interaction, MELLAT and PARSIAN banks placed in the modern banking and customer access facilitation and TEJARAT bank placed in the classic banking and customer access facilitation quarter. Zineldin M. (1996) "Bank strategic positioning and some determinants of bank selection", International Journal of Bank Marketing, 14(6): 12–22. Aghazadeh H., Mina M. (2010) "Iranian commercial banking market orientation Scale", Business Management Perspective, 35(2): 119-143. Ries A., Trout J. (1986) Positioning the Battle for Your Mind, New York: McGraw-Hill. Aaker D.A., Shansby G. J. (1982) "Positioning your product", Business Horizons, 25(3): 56-62. Tanja L. (1993) "Positioning your banks in the customer's mind", Bank Marketing, 25(9):24-30. Azizi S., Hasaninejhad M., Dini A., Omidianm A., Farhikhteh F. (2012) "Identifying expected structural and content attributes of banking advertising slogans", New Marketing Research, 5(2): 21-36. Brady M.K., Bourdeau B.L., Heskel J. (2005) "The importance of brand cues in intangible service industries: An application to investment services", Journal of Services Marketing, 19(6):401–410. Peklo D. A. (1995) "A corporate identity fable", Bank Marketing, 27(3): 29-32. Kotler P., Keller K.L. (2009) Marketing Management, New Jersey: Prentice-Hall. Trout J. (2007) The new positioning: The latest on the world's, New Jersey: Prentice Hall. Kenington C., Hill J., Rakowska A. (1996) "Consumer selection criteria for banks in Poland", International Journal of Bank Marketing, 14(4):12-21. Lee J., Marlowe J. (2003) "How consumers choose a financial institution: Decision-making criteria and heuristics", International Journal of Bank Marketing, 21(2): 53-71. Romaniuk J. (2001) "Brand positioning in financial services: A longitudinal test to find the best brand position", Journal of Financial Service Marketing, 6(2): 111-121. Kotler P. (1994) Marketing management: Analysis,planning, implementation, and control, New Jersey: Prentice-Hall. Stanton W. (1978) Fundamentals of marketing, New York: McGraw Hill. Blankson C., P., Kalafatis S. (1999) "Issues and challenges in the positioning of service brands: A review", Journal of Product and Brand Management, 8(2):106-118. Apte U.M., Vepsalainen A.P.J. (1993) "High tech or high touch? Efficient channel strategies for delivering financial services", Journal of Strategic Information Systems, 2(1): 39-54. Zineldin M. (2002) "Managing in the @ age, banking service quality and strategic positioning", Measuring Business Excellence, 6(4): 38-43. Bahrainizadeh M., Zamni Z. (2015) "Positioning historical sites of IRAN based on importance-performance analysis of attributes and perceptual mapping from foreign tourists", Journal of Management Research in Iran (In Persian), 19(1):1-21. Azizi S., Asnaashari M. (2013) "The impact of internal branding on brand performance in banking industry: The moderator role of competitive climate and job satisfaction", Journal of Management Research in Iran (In Persian), 17(3): 151-165.